Girl talk is a fortnightly magazine packed full of everything a girl aged 7 to 11 could wish for! Each issue focuses on positivity and features inspiring role models from the famous campaign Girls are Amazing! Buy a single copy or subscription to Girl Talk magazine. 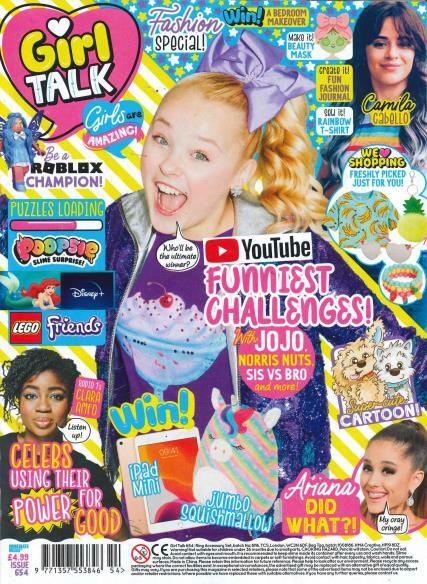 Girl Talk is a pre-teen magazine filled with fashion tips, girly gossip and fun activities. Discover why Macknzie, JoJo, Ariana and more think Girls are Amazing! Plus, find pretty posters, competition with amazing prizes and fab free gifts! Great magazine for my 8 year old daughter, she loves it. This was for my daughter,she absolutely loved having it.will be ordering more issues! The magazine is fab for my 10 year old granddaughter. She loves the free gifts, celebrity gossip and puzzles in it. We have tried the recipes which has been fun. Half her class are buying it, enough said! My 11 year daughter loves this magazine. For my granddaughter and keeps her happy. Love the little gifts. My 10 year old loves this magazine. With the posters and puzzles. Loved by my granddaughter - especially for the small gifts she receives with it. nice magazine for girls from 7 to 12 yrs old I would say. My granddaughter absolutely loves this magazine. She is a bright 9 year old.